Announcement Code New2018 for 10% off No section, Thanksgiving and Christmas cards, Valentines. Enjoy. I now offer poster size 16x20 which is typically $55. Production costs $45 so I only make $10 per poster. Shipping for that is $8.73 and I am only charging you $5 for shipping. Enjoy! Christmas cards are $16.00 for set of 20. Just ask me and I will create the set for you. 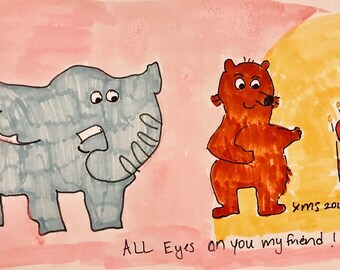 Welcome to the heartwarming loving funny touching art by Lily Bhattacharya PsyD. I will ship internationally, we have to figure out the price. I didn't have the time to list all the countries. My 1st store is www.Lilyb444.com for exquisite jewelry/Whimsical Wire creations. Enjoy and please go see it when you get a chance. When you order, its gets printed on Digital ink and Linen paper. Time: I will take up to 1 week to print with Digital ink ( I am looking into a new printer and this maybe 2 days. Bright White Linen paper so you can frame it. You can images as a Greeting card or Art print, just ask and allow time incase they are not printed at time of order. Your item will not come framed. Thank you. All images are copyrighted and your purchase does not grant you the right to disseminate image or copy and sell/distribute as your own. Thank you. NOTE: If I send your item and it sits in your post office and you never claim it, and then it gets returned to me, you are NOT ENTITLED TO A REFUND. It is your responsibility to follow packaging to its destination. I always use tracking whether with etsy shipping or not. * All trademarked characters or likenesses in this shop are created under the parody fair use copyright law. Many of them will be used in an oracle deck that will be published! Code New2018 for 10% off No section, Thanksgiving and Christmas cards, Valentines. Enjoy. I now offer poster size 16x20 which is typically $55. Production costs $45 so I only make $10 per poster. Shipping for that is $8.73 and I am only charging you $5 for shipping. Enjoy! The ability to draw and paint runs in the family. As a child I would draw endlessly. I never dreamed I would be an artist. I love cartoons and Mary Englebreit's art. I am a counselor, prior psychologist, who makes jewelry and started the store LilyB444. I started doodling this led to me to create an oracle deck and 10 short stories for children. I illustrated each one. I then fell in love with drawing and decided to not stop and keep drawing whatever I wanted. My dream is to illustrate other people's books/decks. I made so many I had to share. Thanks for stopping by. They print my posters and cards with digital ink and paper. This ensures the items last a lifetime. They're a green printer with an attention to detail and a quick turnaround.